Every fall, my wife and I get together with a group of friends and drive out to Markham, Virginia, for an afternoon of apple picking and wine tasting. We've settled on Markham because it's less than an hour's drive from Washington, it offers two orchards to choose from, and there are at least three wineries in the nearby area. This year, we started our day at Stribling Orchard, where we spent a couple of hours wandering through the trees and picking some beautiful looking apples - mostly York and Rome. 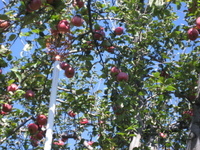 We've learned from past experience that it's far too easy to pick more apples than you can ever reasonably hope to use, so we were careful not to pick too many too quickly. But we readily filled three grocery bags with the help of our friends (a good amount when divided among 8 or 9 people) and then moved on to the second part of our trip - the vineyard. In the past, we've visited Naked Mountain Winery, a Markham winery which offers indoor and outdoor tasting areas that boast a massive fireplace and a breathtaking valley view, respectively, but this year we opted to visit Three Fox Vineyards in nearby Delaplane, Virginia. Three Fox is a labor of love for John and Holli Todhunter, who have worked to give their small vineyard a Mediterranean feel. Guests can sit at tables right near the vines, or they can picnic on the bank of Crooked Run. We set up camp at one of the tables near the tasting room, where we proceeded to unpack a spread of meats and cheeses, chips and dips. While in the tasting room buying a bottle of Viognier (a varietal that most Virginia wineries seem to do really well with), I noticed that they carried cheeses from Oak Spring Dairy, a producer from Upperville, Virginia. I'd love to be able to provide you with a link, but Oak Spring does not have a website - in fact, the only way you'll be able to enjoy their cheeses is if you sample them at one of several northern Virginia wineries, purchase them from farm stores like the one at Stribling Orchard, or visit the dairy itself. I purchased a wedge of Oak Spring's Bay Derby, a cheese that immediately reminded me of the Crab Spice Cheddar I sampled from Chapel's Country Creamery. 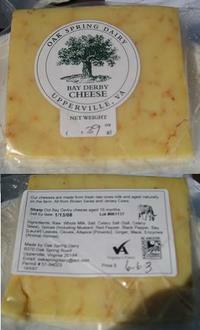 No surprise: the 'bay' in Bay Derby refers to a spice blend that is very similar to that of Old Bay seasoning, and Derby is a semi-firm cheese whose taste and texture are close to those of cheddar. At $6.63 for a .39 lb piece, this cheese would run $17/lb if you could purchase it by weight. 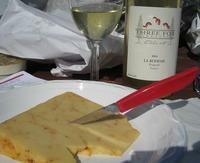 The label identified this as a fresh raw cows milk cheese that is "aged naturally on the farm" for 16 months. The bay seasoning gave the derby a slightly sharp, almost peppery flavor, though the natural butteriness was not overwhelmed by the spice. As the cheese warmed over the course of the afternoon, it even started to give off a faint aroma reminscent of steamed crabs. And it paired wonderfully with the Viognier I bought - the creaminess and the spice both complemented the dry fruitiness of the wine and made for a great combination of flavors. I'm going to be looking for other Oak Spring Dairy offerings at wineries throughout the area next year, and I'll keep you posted about my findings. For now, this one experience will have to suffice as my introduction to a local producer that definitely warrants further exploration. we just went to 3 foxes last weekend and really liked it. There are some other good wineries nearby, we really liked Veremar. I'm drooling over that cheese already! Sounds like a road trip is in my future. It's too bad that DC doesn't have any local "cheese tours" the way New York does... I'd *love* to get to try that.